Yuuki’s present awkwardness with Kaori, and Saki’s avoidance of Kiryu, are both the fault of the guy, and it’s up to them to turn things around. Interestingly, it seems Kaori herself is the catalyst for all of it, by doing what we suggested Yuuki to do, and that is to not let one’s strenuous efforts to retain every past memory interfere with the making of new memories, which is how friendships strengthen and grow. She also asks Kiryu what’s up with Yuuki, and while he tells her grudgingly, he knows its something Yuuki may never admit to her: he’s afraid of being with her, lest she one day lost her memories. The tender earnestness of their exchange provides Kaori with much-needed piece of the puzzle (and the knowledge Yuuki doesn’t hate her), it also inspires Kiryu to sort out his own self-made problem. The conciliatory scene between Kiryu and Saki isn’t long, but it’s extremely sweet. Kiryu capitalizes on the fact their group is up on the rooftop cleaning to confront Saki, and on her inability to run too far away from him, owing to her modest height. Saki merely misinterpreted his reaction to her proposal, something he apologizes for. He agrees to keep letting her rely on him since she’s so intent on it, though he won’t “baby” her the way her girlfriends do. What goes unsaid is that he doesn’t mind being her rock, because he likes her, but it’s implied in their agreement. With that couple’s problem efficiently resolved, it’s back to Yuuki and Kaori, whom everyone, even Kujo, notices a change in their behavior, like they’re forcing themselves. They seriously needed to work things out, so I was heartened when the news came both of them would be going on winter breaks with their families, because that felt like a dead giveaway they’d end up crossing paths. Sure enough, both their family trips are cancelled (or those plans never existed in the first place…?) 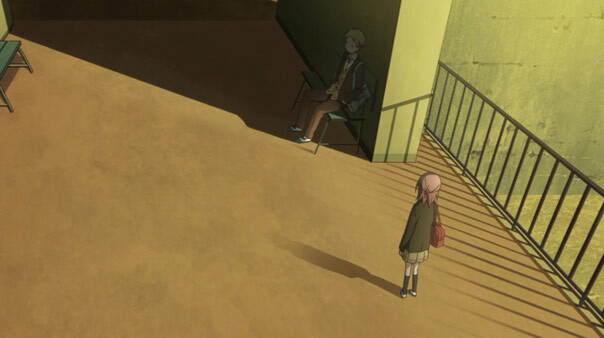 Yet despite this, Yuuki and Kaori walk to the same bridge in what they think are futile hopes of seeing the other there. Their mutual shock and elation at finding each other there is lovely to behold. Though many opportunities arise to part ways, they end up spending the whole day together, because the truth is, neither wants to part ways. First, thank God, at long last, they FINALLY HIT UP THE CRÊPE PLACE! I’m in full agreement with Kaori that it’s “like a dream” watching them sitting there, enjoying the crêpes, together. Had the episode not done this, there’d be a far lower score at the bottom of this review, believe it. The dull grey of their surroundings is pushed to the edges of the frame by their warm colors; they look less in a gloomy fog and more in a kind of fluffy heaven. 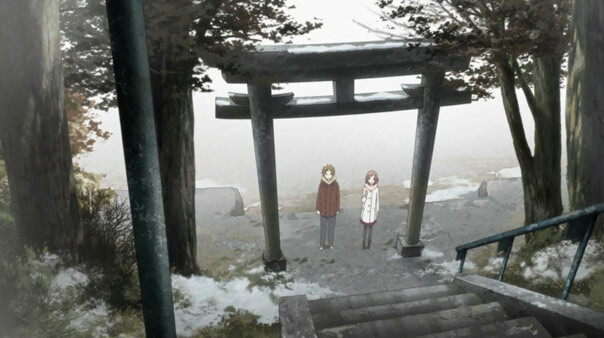 Yuuki walks her home, but they come across a shrine and decide to pray to it. Then Kaori starts to cry out of frustration, not knowing what to do in light of Yuuki’s wishy-washy behavior. While she doesn’t know what to do, she knows what she wants, and tells him: she wants to talk to him more, spend more time with him, and become ever closer friends. You know, what Yuuki wants. His wrongheaded attempts to keep her from crying caused her to cry. 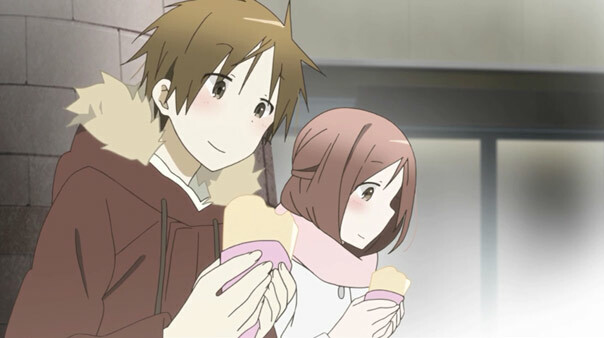 To Yuuki’s credit, he snaps out of his funk, hits himself in the face and insults himself for being such a dolt, and apologizes to Kaori, and goes further to say he wants the same things she does, and lastly, giving her a genuine, unforced smile, borne out of the progress they just made. From now on, they’ll worry less about losing the past or being burned in the future, but focus on making as many new memories together, in the present, as they can. They’re no longer just one-week friends. This was a thoroughly beautiful-looking episode, really making the cold overcast winter sky a major character all its own in terms of setting the mood and reinforcing that this was the end, or winter, of the show. Like we said, as Kaori and Yuuki drew closer, they became a warm island, making the monochromatic starkness less ominous. That’s not to say the whole episode was colorless save the characters. Kaori’s talk with Kiryu has a gorgeous palette and composition reminding us of a de Chirico painting, which also inspired the creator of Ico. 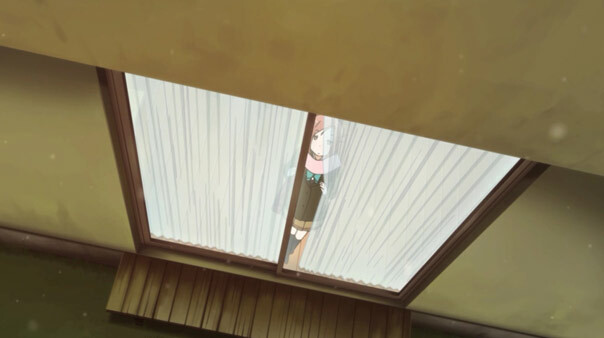 An appropriate aesthetic, considering how isolated and lost Kaori was feeling. Good on both Kiryu and Yuuki for getting over themselves, admitting they’re at fault, apologizing, and working to make things right. Like I said, the balls were in their courts. I’ll admit I *gulped* when Kaori crossed the street, trailing behind Yuuki. 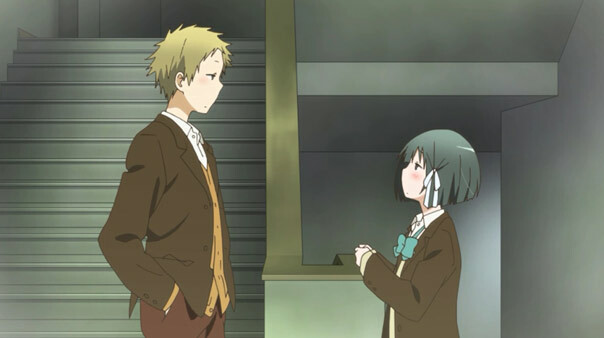 It’s notable that this episode didn’t contain any classic or overt “confessions”, but nor were they necessary, since couples are now on the same wavelength. I’ll forgive this one, but they really stretched that whole “guy sticks around long enough for the girl to finally spit it out” angle to its breaking point. Kaori was never much of a character, let alone friend, so it was weird to see the anime always trying to claim everything was his fault. No, sorry, she’s lucky her inaction didn’t friendzone her, or lose him entirely. It wasn’t until she nearly lost him that she finally managed to blurt out something vaguely approximating “I want to go out with you”. I suspect that one page of her diary she paused at was full of Shining-esque repeats of “ask him out today”. Good thing they had that typically fun cute B-character romance subplot show up just in the nick of time to keep the frustration at bay. Yeah, I was willing to give Kaori the benefit of the doubt, considering how exceedingly inexperienced she was with friends of any kind, let alone potential boyfriends, post-accident. Yuuki is more socially normalized, so the onus was on him to sort things out between them, whether that’s fair to him or not. 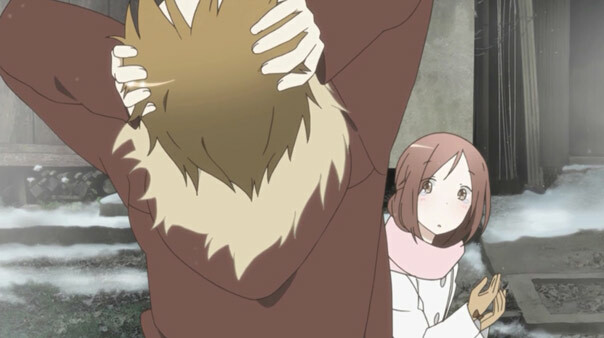 Yuuki’s sudden shift in behavior served to confuse and isolate Kaori further, and he himself admits that was the wrong course, since it caused the very thing he sought to prevent (Kaori being sad). In the end, I’m happy with how things worked out. True, but by the end of the anime it’s quite clear by the middle of the series that he’s done all he can, and that anything more demands some reciprocation from her (since they drop enough hints that she wants more than friendship). That’s basically the problem with these anime: the guys must be white knights who accept all responsibility and blame, and the girls come across as fragile little flowers who are never called out for their own wrongness. Still, that was more or less avoided by this ending, which is why I’m willing to forgive it. 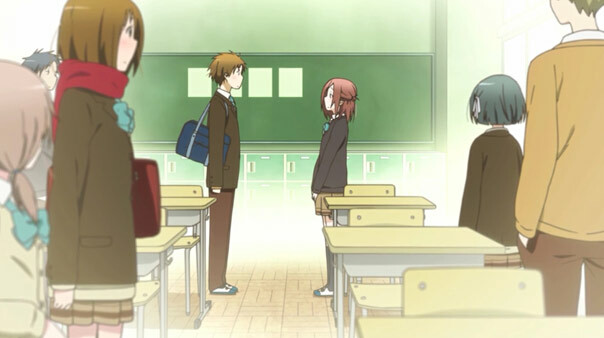 I took it as the vacation plans never existed in the first place and Hase and Fujimiya were just being awkward :P.
I really really really wanted to love this show. I even did for the first 5 eps… then I stopped watching and felt satisfied just catching your reviews each week. correction: obviously I’m watching Knights of Sidonia. Becuase: Duh?? So Good! 1WF was very good; my rating of nearly 8.5 is proof of that…but it isn’t something you should sorely regret missing, nor something you necessarily have to come back to unless you want to be re-immersed. 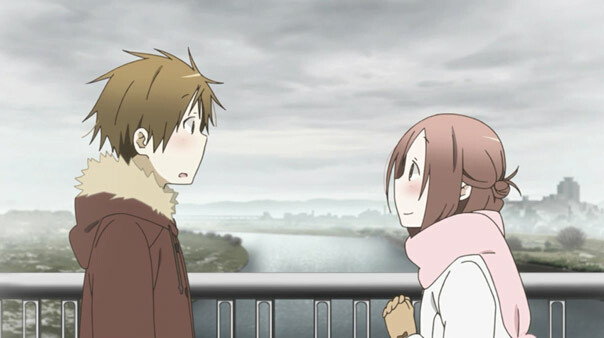 It was a very pretty show and the tender romance worked, but IMO it wasn’t quite as good as Toradora, AnoHana, Sukitte Ii na yo, or most recently, Nagi-Asu.